NASCAR has always treasured the family aspect of the sport and this Father’s Day weekend the sport shines a bright light on the relationships between fathers and their children. Below is a look at some of the active drivers this weekend at Chicago and their fathers that have also participated in NASCAR. 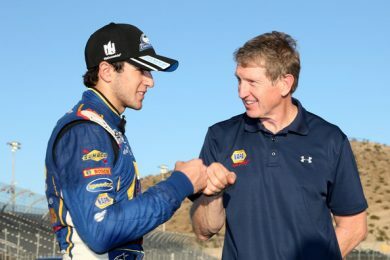 One of the most famous father-son duos in the NASCAR XFINITY Series today is JR Motorsports driver Chase Elliott and his father NASCAR Hall of Famer Bill Elliott. Both have had careers that are quite impressive, though Chase is the only one with a NASCAR XFINITY Series title. Bill Elliott’s career was primarily focused on the NASCAR Sprint Cup Series but he did moonlight in the NASCAR XFINITY Series 43 times, posting one win (Watkins Glen), eight top fives and 18 top 10s. In Chase Elliott’s short career he has started in 46 series races posting three wins (Texas, Darlington and Chicago), 22 top fives and 37 top 10s. Or how about Richard Childress Racing and how they have made competing in NASCAR a family affair. Richard Childress is the grandfather of drivers Austin Dillon and Ty Dillon and the father-in-law to Mike Dillon, Austin and Ty’s father. All four men have competed in NASCAR’s national series competition and continue to work in the organization today. Richard Childress made 285 starts in the NSCS and Mike Dillon has made 154 NASCAR XFINITY Series starts, posting three top fives and 15 top 10s. Austin Dillon has made 88 NASCAR XFINITY Series starts, posting one championship (2013), four wins, 38 top fives, 62 top 10s and 14 poles. He also won the 2011 NASCAR Camping World Truck Series title. Ty Dillon is currently second in the NXS standings. His series-career has seen 58 starts with one win (Indianapolis), 11 top fives and 37 top 10s. Another driver following in his father’s footsteps is Ryan Blaney. Ryan’s father, Dave Blaney is a renowned dirt racer that has competed in all three NASCAR national series (just like his son). Dave Blaney has made 121 NXS starts posting one win (Charlotte) and 31 top 10s. Ryan Blaney will be back in the No. 22 Ford for Team Penske this weekend. Blaney has made 34 NASCAR XFINITY Series starts, posting two wins and 26 top 10s. The newest duo to the father-son NASCAR group are the Kenseths. NASCAR Sprint Cup Series champion Matt Kenseth will get the chance to watch his son Ross Kenseth make his series debut this weekend at Chicago. Matt Kenseth has made 289 starts in the NXS posting 29 wins, 137 top fives, 200 top 10s and 16 poles.